Last year’s flu vaccine protected more people against the disease than any recent season, federal health officials announced Wednesday. That’s likely because the 2012-2013 flu season was especially severe, according to officials from the Centers for Disease Control and Prevention. This year’s flu season is beginning to ramp up, so the agency used the findings to urge all Americans that it’s not too late to get a flu vaccine. “Flu vaccine in a vial doesn’t do any good,” CDC director Dr. Tom Frieden told reporters. Frieden called the findings on flu protection “eye-opening.” Researchers calculated last year’s flu vaccine prevented about 6.6 million cases of illnesses, 3.2 million doctor’s visits, and 79,000 hospitalizations, mostly in seniors over 65 and children younger than 5 years old. These estimates are conservative, the CDC added, using a model that looks at vaccination rates and disease data dating back to 2005. “This is by far the largest number of hospitalizations and medical illnesses prevented,” said Frieden. But the large numbers appear to be a reflection of last year’s flu season’s severity. Flu came weeks earlier than expected and in total caused nearly 32 million illnesses, including 14.4 million that needed a doctor’s visits and 381,000 hospitalizations. The CDC usually cites an average of 200,000 hospitalizations during a flu season. The agency also reported 169 kids died from flu last year, the highest number since 2004. In the prior 10 flu seasons before last year's epidemic, between 43 and 153 children died. Estimates for illnesses and medical visits were lower than what was seen during 2009-2010, when an H1N1 “swine flu” pandemic resulted in about 52 million flu cases and 24 million doctor visits. Findings for last year’s vaccine effectiveness were published Dec. 12 in Morbidity and Mortality Weekly Report. CDC researchers also looked at vaccination rates for high-risk groups including health care workers and pregnant women. They found vaccination among pregnant women (41 percent) and health care providers (63 percent) is about the same as it was this time last year, about 41 percent and 63 percent respectively. Officials said more could still be done to increase vaccination rates. If 70 percent of all Americans got a flu shot last year, another 4.4 million cases of flu and 30,000 hospitalizations could have been prevented. So far this year, only 40 percent of Americans aged 6 months and older have gotten a flu shot, according to early CDC estimates. While flu activity is still mild throughout the country this year, it's starting to pick up. 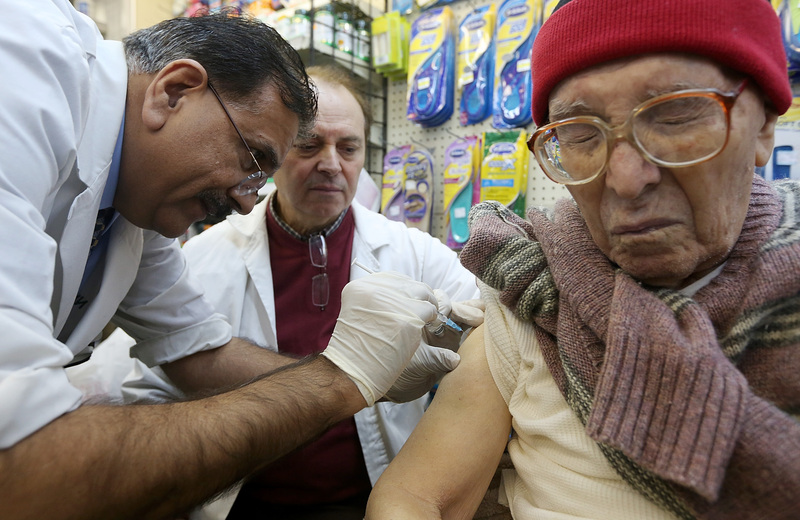 The unpredictable nature of last year’s season should serve as a reminder that it’s not too late to get vaccinated, the CDC warned. Flu often peaks between January and March, based on previous flu seasons. “This year we’re lucky because the flu season hasn’t taken off wildly yet, so it’s not too late to get vaccinated and make sure you protect yourself and your family,” said Dr. Anne Schuchat, director of the National Center for Immunization and Respiratory Diseases. The CDC says this year's 2013-2014 flu vaccine was about 61 percent effective, meaning people who got the shot were about 61 percent less likely to have to see a doctor for flu-like illness.